These images were acquired by the German Optical RapidEye and radar TerraSAR-X satellites. They show Torinoumi on the eastern coast of Japan before the disaster on Sept. 5 2010 and after the tsunami on March 12, 2011. The German Aerospace Center, DLR, is responding to the disaster through its Center for Satellite Based Crisis Information to provide information for the International Charter. 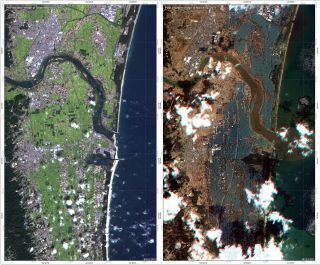 In the aftermath of Japan's devastating earthquake and tsunami, satellite maps have been a vital part of search and rescue efforts by providing clear pictures of how the land has changed, and where buildings and roads once stood. Satellite imagery of the areas hit hardest by the 9.0-magnitude earthquake and subsequent tsunami that struck the northeastern coast of Japan on March 11 is being provided by several space agencies and operators around the world to assist the relief efforts currently underway. The International Charter was founded 10 years ago as a way to combine Earth observation data from different space agencies. "By combining Earth observation data from different space agencies, the Charter allows resources and expertise from around the world to be coordinated for rapid response to major disasters," officials with the European Space Agency explained in a statement. This map shows a comparison of RapidEye pre-disaster data acquired on Sept. 5, 2010 and post-disaster data acquired on March 12, 2011. More than 63 satellite observations were made in the first 48 hours following the powerful quake. Data is being collected from a wide range of satellites, including spacecraft from the U.S., Germany and France. The satellite images are being used to map and assess the stricken areas. Japan's northwestern coastline is thought to have shifted by as much as 13 feet (4 meters) to the east, and whole towns have been washed away by the tsunami, completely changing the landscape. Over the coming weeks, access to updated satellite data will prove essential for continued crisis response, recovery and reconstruction. The information will also be used to help further scientists' understanding of geological threats and ultimately help with future warning systems. Japan lies on the infamous Ring of Fire, an active zone that almost encircles the Pacific Rim. As such, Japan is listed as a 'supersite', an area known to be at high risk of seismic events. The March 11 quake was the largest ever recorded in Japan and is the world's fourth largest earthquake to strike since 1900, according to the U.S. Geological Survey (USGS). The epicenter of the earthquake was 231 miles (373 kilometers) northeast of Tokyo and 80 miles (130 km) east of Sendai on Honshu, Japan's main island, according to the USGS.